Masterclass Agenda: The masterclass agenda is aligned to CXPA Competencies, this will also be helpful in gaining prestigious global customer experience Certification - CCXP by Customer Experience Professional Association. This masterclass agenda will help CXOs, industry practitioners and consultants to become adept at creating and delivering outstanding customer experiences for their companies and clients. 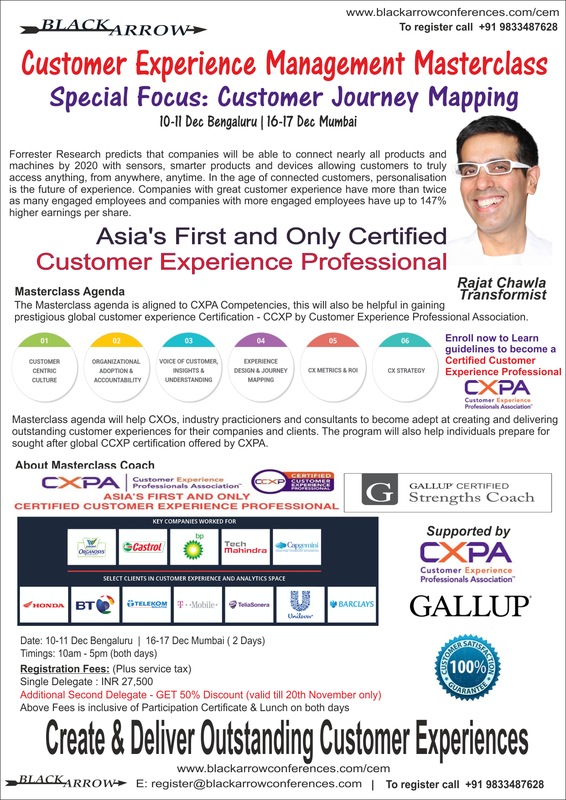 The masterclass will also help individuals prepare for sought after global CCXP certification offered by CXPA. Special Focus: Customer Journey Mapping is the process of capturing the total customer experience across all touchpoints in your organisation and identifying the gaps. Journey map tells the story of the customer’s experience: from initial contact, the process of engagement and into a long-term relationship. We will help cross-functional teams visualise across various elements of customer experience management using human centered design thinking approach.